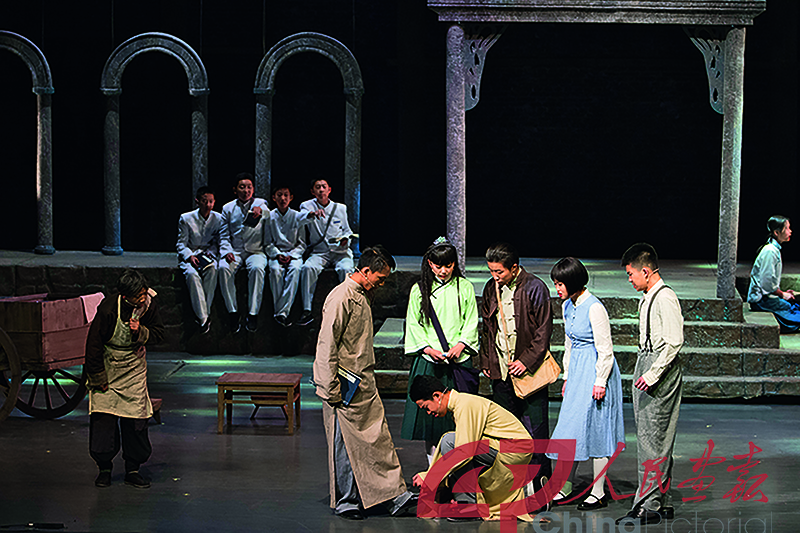 On April 2, 2018, Beijing’s most prestigious professional theater, the Beijing People’s Art Theatre (BPAT) and the Beijing Municipal Education Commission jointly established the Beijing Campus Theatre Education Alliance (BCTEA), aiming to popularize theatrical culture and education across Beijing’s campuses, ranging from primary schools to colleges. The first group of BCTEA members includes 27 schools and school districts across Beijing. After joining the alliance, these schools will incorporate drama education into their daily aesthetic education. Through professional guidance, drama education will become a natural supplement to quality-oriented education. “Thanks to the establishment of the alliance, our theatre can perform better and more systematic educational work and bring drama to the campus to benefit more children,” BPAT director Ren Ming said. First, the BPAT will bring its productions to those schools. The first stop will be Tsinghua University. Second, artists and theatrical professionals from the BPAT will give lectures on campus and help students rehearse plays. Moreover, students can visit venues such as Beijing Capital Theatre, BPAT Museum and Juyin Theatre, all of which are open to the public. Student visitors can sit in on rehearsals and participate in various drama activities. More than a decade ago, artists from the BPAT first began to go to various schools to promote drama. They established drama education bases in two secondary schools, and regularly sent personnel there to teach various classes and organize rehearsals. Through such drama education bases, how can these institutions provide educational resources that benefit every student? Tang Ye (right), a well-known director of the Beijing People’s Art Theatre, directs a scene. Du Mingcong, a freshman at Beijing No. 166 Middle School, another drama education base launched by the BPAT, is a beneficiary. “Learning the script and performing has made me more confident in other aspects of my life and helped me understand literature more profoundly,” Du asserted. China’s implementation of reform in quality education in the early 1990s triggered growing attention to aesthetic education such as drama and music. “The purpose of setting up an alliance is to explore how to maximize our drama education resources,” said Wang Jun, director of the Physical and Artistic Education Department of the Beijing Municipal Education Commission. The situation is not as optimistic as the founders of the alliance would like it to be. One concern is how to build drama education into mainstream in more schools. After World War II, Western countries continued to explore the theories and practice of educational theater and drama. Drama education in many countries has now been institutionalized and standardized. For example, Britain formally included theatrical events as part of the national English curriculum standards. The United States has already formed a complete drama education system covering kindergartens, elementary and secondary schools, and even colleges and universities. In early 20th-century China, just a few years after Western drama was introduced, Zhang Boling (1876-1951), a famous contemporary educator, adopted Western theater education ideas and used drama as a way to nurture talent and improve society, leading China to incorporate drama into the educational system. Since then, many Chinese educators have followed suit, practiced his ideas and used drama to facilitate various kinds of social education. For example, famous Chinese educators Tao Xingzhi and Yan Yangchu used drama as a powerful, effective means of public education and spared no efforts to accelerate theater campaigns among farmers. However, there are still some concerns: How should China develop drama today and utilize the educational function of drama? How should drama veer off of the stage, enter society, and go public with the help of modern media? From the concepts introduced by Zhang Boling to extensive and widespread efforts in teaching and educating people through the use of theatrical forms, drama education still has a long way to go in China.